Join us to celebrate WITI's 15th Anniversary at WITI's National Conference on June 8 & 9 at the Doubletree Hotel in San Jose, CA. General admission, Executive Program, Hall of Fame dinner, and Exhibit Hall registrations are still available. Register now! Aly has worked in IT services for more than 20 years, at companies including Xerox, Gulf Oil, IBM and Microsoft. Aly's last IBM assignment before joining Microsoft in December 2002 was as VP of Communications for IBM Canada. She also spent some time as VP of e-business services for IBM Global Services. Many people are unhappy in their work place. Tolstoy felt all unhappy families were different, but when it comes to our working lives there are recurrent patterns of discontented, inauthentic behaviour. Unhappy patterns include quitting and staying, getting caught in the trappings of success and being in opposition - the state I will focus on in this article. By recognizing these discontented patterns, we can transcend them. Register today to see Barbara Annis, author of Same Words, Different Language at WITI's National Conference on June 8 & 9, where she will be speaking on "Women in Leadership and Authenticity". Register today for Jane's upcoming Teleclass, "How to Get Unstuck". Diet Wars: Low-carb or Low-fat? The diet controversy continues. Should you go low-carb or low-fat? Building, configuring, and installing new application systems or new technologies are enormous jobs. Business requirements must be defined and negotiated. Application design and development or configuration can be resource-intensive. There's always so much to do and corporate management wants it all done yesterday. With so many technical tasks to handle, companies often give insufficient attention to the preparation needed to effectively introduce work groups and management to the new systems and technologies. Philology - the love of learning - consultants fill this gap with skilled human performance technologists, experienced in planning and executing change management, training, and performance support for business users. 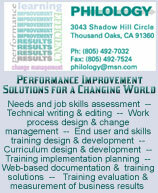 Philology consultants are skilled in analysis and performance improvement initiatives for IT work groups, call center and customer service personnel, financial services teams, and sales organizations. We have partnered with global companies in many industry segments, including biotechnology/pharmaceuticals, mortgage and financial services, high technology manufacturing and systems vendors, automotive, insurance, utilities, and retail operations. For additional information, contact Michelle Halprin, Philology Instructional Design at (805) 492-7032. WITI's National Conference is almost here! Don't miss this amazing opportunity to network, network, network on the exhibit floor. Meet with representatives from companies like Advanta, AT&T, Carnegie Mellon University, Genentech, JPL, Microsoft, Raytheon, T-Mobile, and Sony -- companies who aren't just looking for a handful of new college grads! WITI members and non-members alike are invited to visit the National Conference Exhibit Floor for FREE! For more details and to register. Join us to celebrate the accomplishments of this year's inductees at our Ninth Annual Hall of Fame Induction Ceremony dinner! When: Tuesday, June 8th at 5PM at WITI's National Conference. Reception starts at 5:30 PM. Registration: $150 per person includes Taste of Technology Reception, and Hall of Fame dinner. To register, call 800-334-9484 or register online. [email protected] keeps you up to date on where you will find WITI partners, WITI discounts, WITI women attending industry events. The complete list is online. If you want a discount to an event you will be attending and/or want to meet other WITI women at that event, just let us know so we can get it for you!